Bret Merrick at his arraignment Jan. 25 after being charged with one count of felonious assault, two counts of complicity to aggravated murder as well as complicity to aggravated burglary. YELLOW SPRINGS — Dustin M. Merrick of Xenia and Bret S. Merrick of Centerville were arraigned Jan. 25 in connection to the double homicide in Yellow Springs nearly two weeks ago. Dustin Merrick, 25, has been charged with two counts of aggravated murder. Bret Merrick, 24, has been charged with one count of felonious assault, two counts of complicity to aggravated murder as well as complicity to aggravated burglary. Bond for both individuals is set at $750,000 with no 10 percent. William Brown, 44, of Yellow Springs was shot multiple times inside a duplex-style home Jan. 15, and Sherri Mendenhall, 63, also of Yellow Springs, was shot once and found in the driveway at the same residence, located on the 4400 block of East Enon Road just outside of Yellow Springs. The grand jury will meet to discuss the case Wednesday, Feb. 1. The Greene County Sheriff’s Office and Attorney General Mike DeWine’s Bureau of Criminal Investigations served a search warrant Jan. 24 at 1042 Parnell Dr. in Xenia in conjunction with the double homicide. Officials said during a press conference Jan. 25 that Dustin Merrick was previously developed as a suspect and was at the residence at the time the search warrant was served and was taken into custody. Fischer said that Bret Merrick was also located and interviewed Jan. 24. In addition, Fischer said that Bret Merrick was Mirandized and allegedly admitted that he was with his brother, Dustin, during the early morning hours of Jan. 15 and accompanied him to the home where the alleged crime took place. Fischer said Bret Merrick admitted that the pair entered the apartment without permission, both with firearms in their possession, which Bret Merrick said he used to shoot at Mendenhall from Brown’s apartment. Bret Merrick said told police he did not strike her with a bullet, according to Fischer. Fischer said Bret Merrick admitted that they kicked in Mendenhall’s apartment door, forcibly entering the space. “Both these facts support that the suspects intruded the victims’ apartments,” Fischer said. Analysis on Brown’s cell phone determined that he attempted to call 911. Dustin Merrick was interviewed Jan. 20, in which investigators seized a nine millimeter Taurus firearm as well as a search warrant to determine a DNA analysis, according to officials during the press conference. BCI determined Jan. 24 that the gun was operable and allegedly matched three spent rounds of nine millimeter ammunition obtained from Brown’s apartment. Fischer added that BCI analysis further determined that an unspent round from a nine millimeter firearm obtained from the scene found Dustin Merrick as a major contributor to the DNA profile found on the live round. 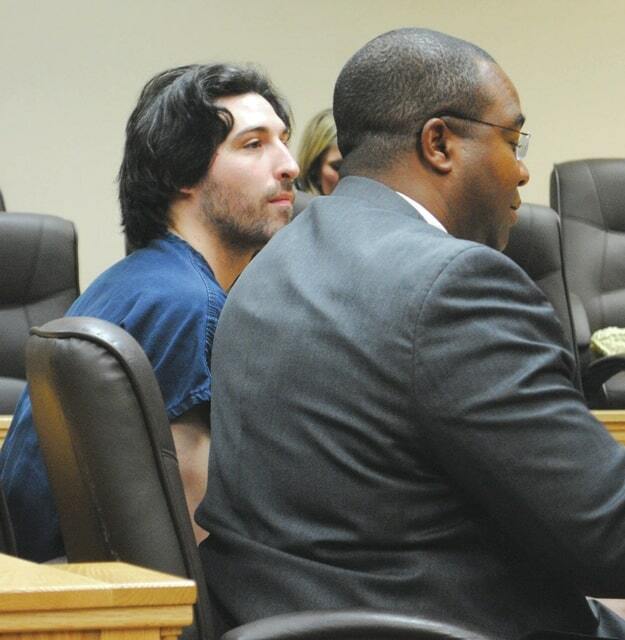 https://www.recordherald.com/wp-content/uploads/sites/27/2017/01/web1_yshom1.jpgBret Merrick at his arraignment Jan. 25 after being charged with one count of felonious assault, two counts of complicity to aggravated murder as well as complicity to aggravated burglary.